Thousands of holidaymakers on Monday thronged the country's popular beaches to mark the Republic Day with parties and picnics. When the Ghana News Agency visited some beaches in Accra around midday, there were large crowds of revellers drinking the time away, some taking a swim in the sea and others engaging in various fun games to the blaring of popular songs and Hip life music, despite the fact that, the next day, Friday, is a working day. At the Dansoman Pleasure Beach the teeming crowd seemed uncontrollable, as it was not clear who was in charge of the action, since entry was free to anyone who wished to pass the time off. 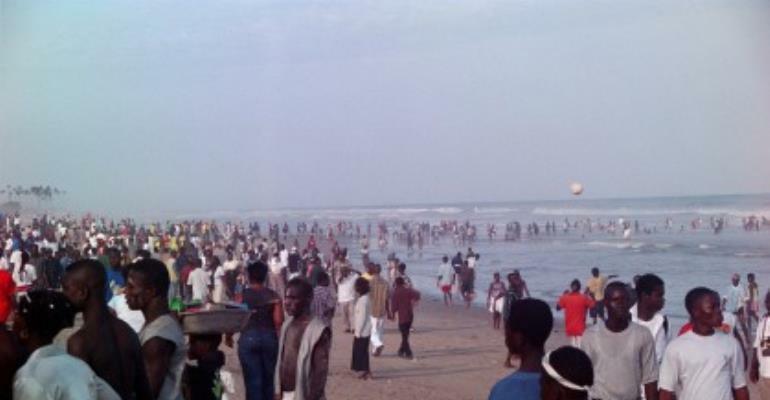 It was, therefore, not surprising to see children, swimming in the sea in the absence of guards and security men and a situation that posed a grave danger to them. At the Korle-Gono Beach, there was quite a good organization. The beach's security details were present to keep order and protect the holidaymakers from intruders and thieves. An official at the Resort who spoke on anonymity told the GNA that swimming guards had been engaged to ensure safety at the beach, with areas demarcated for safe swimming. The scene was not much different at the La Pleasure Beach. Not even the twenty thousand cedis charged at the gate could deter the packed crowd from getting onto the beach. The queues were long, while anxious holidaymakers patiently waited for their turn. There was heavy security detail on hand to prevent any chaotic scenes. An official said various safety measures had been made to protect the lives of swimmers and to prevent accidents due to poor security and non-compliance of safety requirements. He explained that the heavy presence of the Police at the beach was to maintain order, protect property and keep intruders at bay. Other holidaymakers were also enjoying themselves at the less developed sites at the eastern and western ends of the La beach. Most people who live around the beach took the opportunity to make some money by selling edibles and drinks at inflated prices to the holidaymakers. However, most people who could not afford the gate fees at the more organized beaches had to make do with the Independence Square beach.